With Saturdays brilliant ride from Windsor to central London still in my thoughts, Andrew and I didn't want the fun to end so we were both taking part in the 52 mile 'Bikeathon.' This is a charity ride specifically for leukaemia and lymphoma research. Our start time was 08:00 but Andrew and I had agreed to meet outside Holborn tube station at 07:30. We were both wearing the red T-shirts that you can see in the pictures below and soon made our way the short distance to the start at Corum's Fields. At the start there was a great atmosphere and recording of people who gave their reasons for doing the event were quite humbling. As we waited at the start my legs felt fine as did the rest of me. I may have done well approaching 60 miles the day before but I felt good. Before long we were off onto the open road. We were given instructions to not jump tree lights etc.., and it was a shame to see quite a few participants do just that. The route was lovely as was the weather. It took us from Corum's Fields near the British Museum to Canary Wharf, then out to Richmond Park and then back into central London. In fact I remarked to Andrew that it would make a very good club ride - perhaps to be done at night? As we cycled along lots of memories from previous rides came into view. I love London. There is just something magical about it that I can rarely express to any satisfaction. So much to see and always something new in the familiar. As we entered Canary Wharf the buildings gleamed in the morning sun. Security guards waved us on and there was generally a great reception to the cyclists in red T-shirts. I don't think my Partner in Crime Andrew would mind me saying this but a year ago he might have struggled doing this ride, having done a long distance ride the previous day. I have to report that I was going at a fairly brisk pace and when I turned to see if Andrew was there he was. My riding partner had been tenacious in improving all aspects of his cycling and it certainly showed on this ride. Just before we reached Richmond Park at about 23 miles Andrew and I lost each other. Unfortunately this is sometimes inevitable on large rides with lots of people but I knew he would be okay. Once in Richmond Park I was very much in familiar territory. I was hoping that we would be cycling up one of the steep hills as I fancied taking the scalp on an unsuspecting roadie. Sadly, our route was pretty tame and flat. The rest point - which we had been thinking was much sooner - came at 34ish miles at Ham. I replenished my water several times and stocked up on some of the energy bars. I waited about 15 minutes for Andrew but unable to see him I headed back out to complete the rest of the ride. This was where true to form I got lost but I was in good company as about 50 or so fellow participants were lost with me. I knew things weren't right as I started to recognise the route for our many evening rides to Box Hill. I got out my phone and used google maps to navigate the way back to where I suspected we would pick up the official route. I was joined by quite a few other riders and ended up being lead navigator for a short while. Finding the route - big sigh of relief - I pushed towards the end. As soon as I saw central London in the distance I started to up the pace. My Garmin was telling me that my average pace was 13.5 mph which is what it stayed at until the end. My legs didn't feel tired so I pushed a little harder. Mrs Orange and the Orangettes were waiting for me at London Zoo and I was keen to join them. With the end in sight I crossed the start / finish line at about 12:50 p.m. having done an extra two and half miles! A medal was placed around my neck and a banana thrust into my hand. I was grateful for both! Stocking up on water and taking a few photos I wasted little time and headed for my car which I had parked nearby. I drove to London Zoo where I met my family and finally got to see the new baby tigers. Normally, I would also post a picture of the medal. It was a lovely one but I won't be keeping it. Instead I am going to give it to a work colleague who in the last 17 months was diagnosed with lymphoma, went through a lengthy bout of chomotherapy and is now in remission. I'm familiar with many of the areas you mention in your article. I used to come down to London and Windsor often when my friends stayed there. 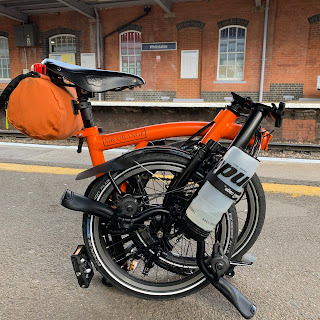 My original folder was a Dahon which is great for the hilly Scottish terrain but I wanted a more compact folder for transporting on trains and in car boots. I decided to buy a Brompton, which I love. Evans only had orange and white in the style I wanted so I choose orange. There are not many Brompton's in Glasgow so mine generates a lot of interest when I take it out.